If you’ve been a pet parent long, you’ve likely heard about bio-enzymatic or ‘enzyme’ cleaning products. But unless you have a background in Biochemistry the ‘how’ behind the ‘what’ probably remains a mystery. No one wants to use a product they’re not sure of – so we’ve put together a brief explainer on bio-enzymatic cleaners. 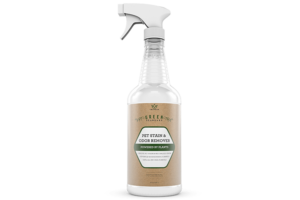 Pet stain removers work by using good bacteria and enzymes that basically consume organic material. As the organic matter (your pet’s mess) is consumed, the stain and odor dissipate. Each product is different, but you’ll generally want to spray on and let it dry for best results. What is in enzyme cleaners? The main difference between these products and a standard carpet shampoo is bacteria and enzymes. These two organic components work together to create a natural cleaning solution. Just like there are ‘good’ bacteria for your body (yogurt, probiotics, etc.) these non-pathogenic bacteria provide benefits without any health risks. Enzymes attach themselves to the staining agent, be it blood, urine, feces, or food and break it down. (There are other types of enzymes which target different types of stains – but most Pet products use Protease enzymes which target protein based molecules). The enzymes attach themselves to the staining agent and as long as the area is moist and more of the ‘food’ is available, the bacteria will multiply and continue ‘feeding’ on the stain thanks to the work of the enzymes. Eventually, the stain is gone as is the odor. Is it safe to use enzyme cleaners? Actually, because these products are non-toxic, they’re actually safer than most chemically based products! When the soiling agent has been broken down and consumed the bacteria die off (this is why most enzymatic cleaners recommend vacuuming the surface once it is completely dry). Enzyme cleaners have become immensely popular because they’re both safer and more effective than traditional methods when it comes to treating pet messes. Don’t get frustrated with old messes, they can be treated but often require multiple cycles. Let us know what type of furbaby you have and if you’ve had success with enzyme cleaners in the comments below! Please note: shopping on Amazon using the links from this page may result in TriNova receiving a referral commission. Genesis 950 has worked in my house!!! I foster dogs and cats and accidents happen, especially when a new animal comes in. It’s so hard to get rid of that cat urine smell especially and I threw away many area rugs before finding 950. It’s amazing!